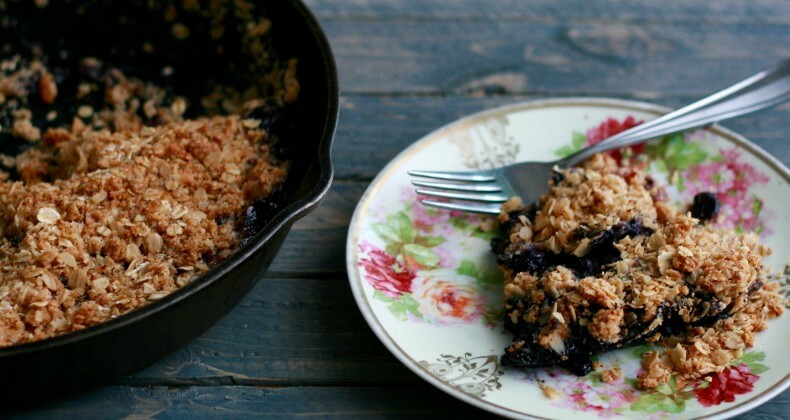 Crisps, crumbles, cobblers, slumps, buckles, and boy baits are all a little different in form but what they do have in common is they all are a slightly sweet dessert encasing my favorite summer fruits. I am a little partial to the crisp and nostalgia plays a big role in my preferences. This weekend we had friends over for dinner and I wanted an easy summery dessert to serve. On my island I had six ripe and fragrant peaches that were begging to be turned in to a dessert. Originally this was just going to be peach crisp but since I was serving eight people I padded it with a pint of blueberries. Some times spilt-second decisions really pay off. When it comes to crisps the topping is just as important as the fruit filling. Personally I always double the crisp topping when following a recipe so when writing my own recipe I have already written it doubled. 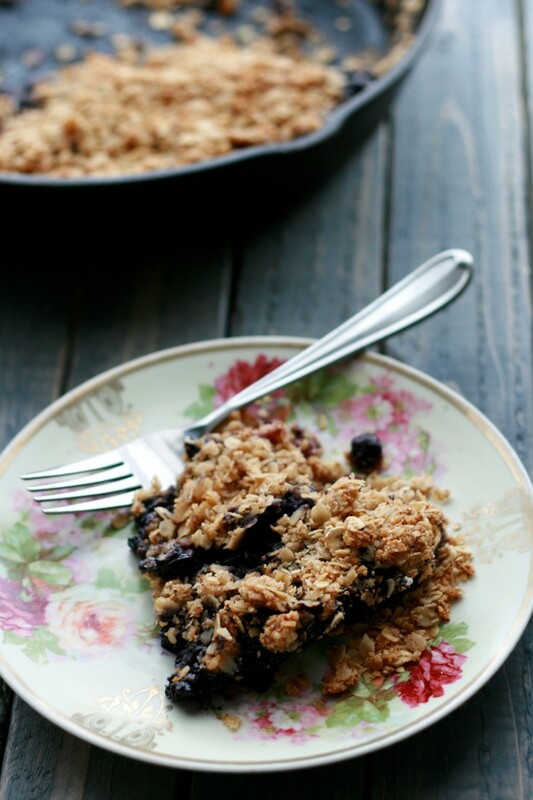 Crisp topping lovers this recipe is for you (and me). If you’re reading this when peaches and blueberries aren’t in season sub thawed frozen ones and add 1-2 tablespoons cornstarch to help thicken the juices. I left the peach skins on to make this no hassle dessert but you could easily slip them off by cutting a “X” on the bottom drop them in boiling water for 15-20 seconds then drop them in ice water. The skins should slip off easily. This crisp is extra special because I subbed bacon fat for some of the butter. Save your bacon fat and try it this way. Mmm hmmm! Almond flour replaced regular ole flour to give it a slight nutty note and paired with certified gluten free oats you have yourself one taste gluten free dessert. Can use regular all-purpose flour and rolled oats instead of the gluten free variety if you aren't worried about gluten sensitivities. That looks so good! I get berries from a bush in our yard called Service Berry AKA June Berries. I’ll have to try that with them. They taste very similar to blue berries. Oh goodness, gracious, hand me a big plate and I hope you allow for me to come back for seconds! What a beautiful crisp!